On 21 August 2018, MLiA and the Department of Planning, Monitoring, and Evaluation (DPME) co-hosted a one-day workshop on the coordination of mineral regulation and compliance across different organs of state. The workshop was held at the University of Cape Town. The regulation of mining is the exclusive competence of the Department of Mineral Resources. However, many other government departments are impacted by or have a role to play in the mining industry. Those officials entrusted with implementing compliance or regulation of specific aspects of mining governance,need clarity about their functions and how these relate to their peers in other departments. Various government departments entrusted with ensuring regulatory compliance for mining, report the need for effective internal communication and integrated processes. Systems may be incompatible for the cross-sharing of information, which will affect counterparts in other departments. This creates a knowledge imbalance within government and constrains cooperation between different departments. The workshop served as a scoping exercise to assess current efforts at coordination and the extent of the need for integration and systemic support. The workshop forms part of a larger project of MLiA, which aims to map the respective application processes for mining rights, environmental authorisations, water use licences and rezoning of land. Based on a workflow diagram created by the MLiA team, aspects of legislative uncertainty and inconsistency have been identified. Identification of these issues can assist to improve the efficiency of processes prescribed by the Mineral and Petroleum Resources Development Act and other related legislation. The purpose is to improve intergovernmental relations and cooperative government initiatives. To scope the extent of the needed intervention, the workshop evaluated the processes and involvement of different government departments in the mining context. The workshop served as a platform for representatives from different departments to highlight and discuss current difficulties and frustrations experienced, but also successes achieved in coordinating activities relating to the implementation of decisions about mining with other affected departments. Discussions were structured according to five themes: Mining Right Applications and Cooperative Government; Community Consultation and Section 10 Notices; The One Environmental System; Social and Labour Plans and the Integrated Development Plans; and Spatial Development Frameworks and Land Use Schemes. Key stakeholders from various quarters of government participated in the scoping workshop. These include the Departments of Mineral Resources; Environmental Affairs; Water and Sanitation; Cooperative Governance and Traditional Affairs and Rural Development and Land Reform. 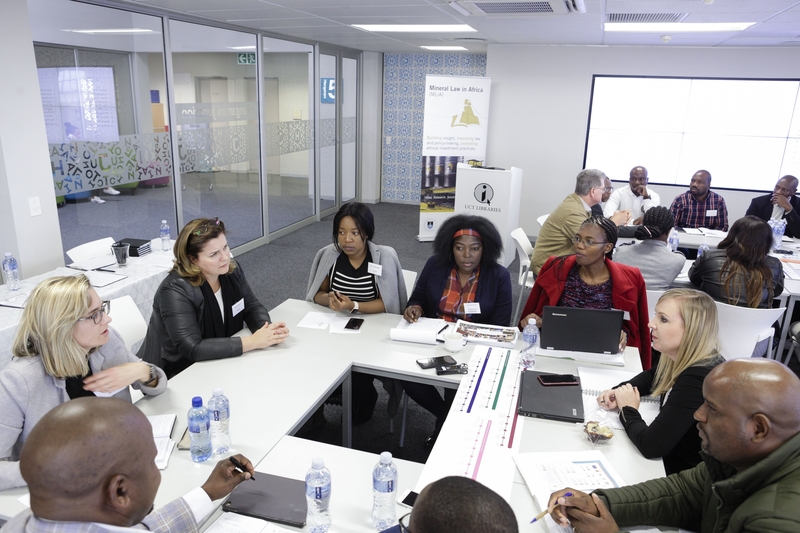 Representatives from City of Cape Town, City of uMhlathuze, Moses Kotane, Lephalale, Musina Local, Ba-Phalaborwa, Sol Plaatjie, and Thabazimbi Municipalities participated in lively discussions of the different themes. PetroSA and representatives of the EU-LA Mining Programme also attended. Various issues have been identified during the workshop. The findings of the workshop will be published and a follow-up workshop is planned for February 2019. MLiA gratefully acknowledges the enthusiastic participation and the generous time commitments of all workshop attendees to improve cooperative governance in the mining context.